1. 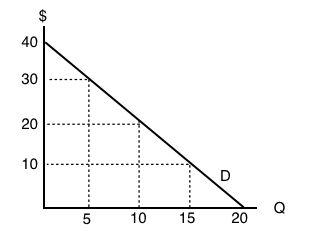 Use the demand curve diagram below to answer the following question. What is the own-price elasticity of demand as price increases from $2 per unit to $4 per unit? Use the mid-point formula in your calculation. 3. If own-price elasticity of demand equals 0.3 in absolute value, then what percentage change in price will result in a 6% decrease in quantity demanded? 4. Suppose you are told that the own-price elasticity of supply equal 0.5. Which of the following is the correct interpretation of this number? a) A 1% increase in price will result in a 50% increase in quantity supplied. b) A 1% increase in price will result in a 5% increase in quantity supplied. c) A 1% increase in price will result in a 2% increase in quantity supplied. d) A 1% increase in price will result in a 0.5% increase in quantity supplied. 5. Suppose that a 10 increase in price results in a 50 percent decrease in quantity demanded. What does (the absolute value of) own price elasticity of demand equal? 6. If goods X and Y are SUBSTITUTES, then which of the following could be the value of the cross price elasticity of demand for good Y? 7. 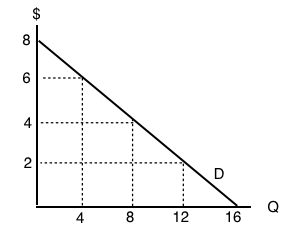 If pizza is a normal good, then which of the following could be the value of income elasticity of demand? 8. If goods X and Y are COMPLEMENTS, the which of the following could be the value of cross price elasticity of demand? d) All of the above could be the value of cross price elasticity of demand. 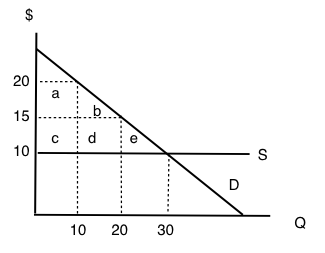 Use the demand curve diagram below to answer the following TWO questions. 1. What is the own-price elasticity of demand as price decreases from $8 per unit to $6 per unit? Use the mid-point formula in your calculation. 2. At what point is demand unit-elastic? 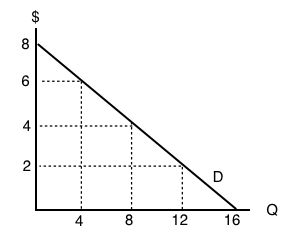 a) P = $6, Q = 12.
b) P = $4, Q = 8.
c) P = $2, Q = 12. 3. Which of the following statements about the relationship between the price elasticity of demand and revenue is TRUE? 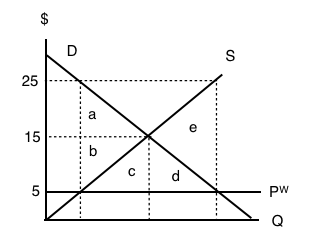 a) If demand is price inelastic, then increasing price will decrease revenue. 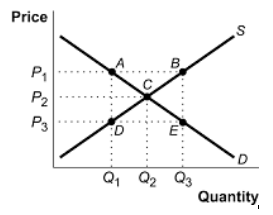 b) If demand is price elastic, then decreasing price will increase revenue. c) If demand is perfectly inelastic, then revenue is the same at any price. d) Elasticity is constant along a linear demand curve and so too is revenue. 4. Suppose BC Ferries is considering an increase in ferry fares. If doing so results in an increase in revenues raised, which of the following could be the value of the own-price elasticity of demand for ferry rides? 5. Use the demand diagram below to answer this question. 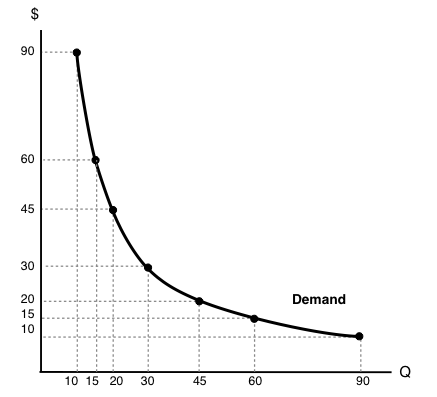 Note that P × Q equals $900 at every point on this demand curve. 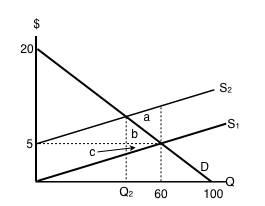 Which of the following statements correctly describes own-price elasticity of demand, for this particular demand curve? I. Demand is unit elastic at a price of $30, and elastic at all prices greater than $30. II. Demand is unit elastic at a price of $30, and inelastic at all prices less than $30. III. Demand is unit elastic for all prices. 6. Suppose that, if the price of a good falls from $10 to $8, total expenditure on the good decreases. Which of the following could be the (absolute) value for the own-price elasticity of demand, in the price range considered? d) Neither a) or b). 7. 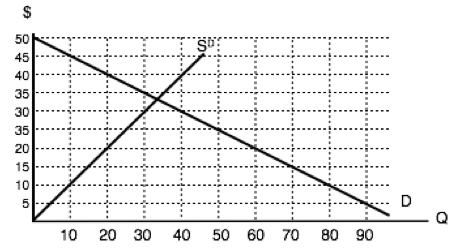 Consider the demand curve drawn below. At which of the following prices and quantities is revenue maximized? a) P = 40; Q = 0.
b) P = 30; Q = 5.
c) P = 20; Q = 10.
d) P = 0; Q = 20. 1. Which of the following CANNOT reduce the equilibrium quantity sold in a market? d) All of the above can decrease equilibrium quantity sold. 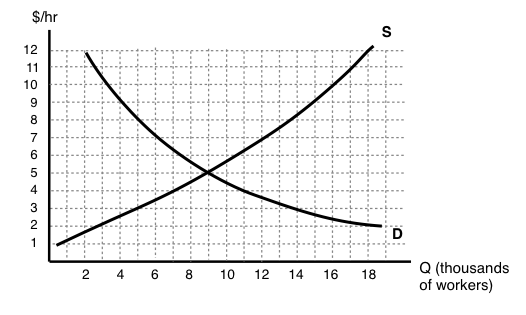 Refer to the supply and demand curves illustrated below for the following THREE questions. Consider the introduction of a $20 per unit tax in this market. 1. Which areas represent the loss to consumer AND producer surplus as a result of this tax? d) k + f + j + g.
2. Which areas represent the gain in government revenue as a result of this tax? 3. Which areas represent the deadweight loss associated with this tax? a) Consumers are worse off as a result of the tax. b) Spending on socks may either increase or decrease as a result of the tax. c) Producers are worse off as a result of the tax. d) This tax will result in a deadweight loss. 5. 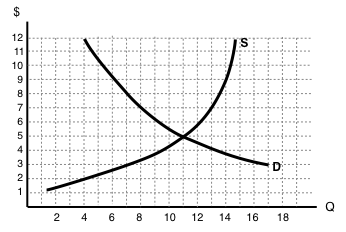 Refer to the supply and demand diagram below. 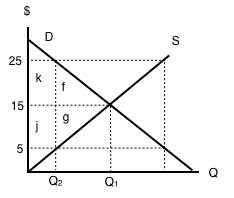 If an subsidy of $3 per unit is introduced in this market, the price that consumers pay will equal ____ and the price that producers receive net of the subsidy will equal _____. Use the diagram below to answer the following TWO questions. 7. If a $6 per unit tax is introduced in this market, then the price that consumers pay will equal ____ and the price that producers receive net of the tax will equal _____. a) If there is a deadweight loss, then the revenue raised by the tax is greater than the losses to consumer and producers. b) If there is no deadweight loss, then revenue raised by the government is exactly equal to the losses to consumers and producers. 10. Which of the following correctly describes the equilibrium effects of a per-unit tax, in a market with NO externalities? 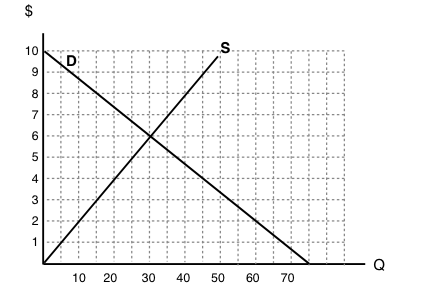 d) Consumer surplus, producer surplus, and social surplus all decrease. 11. Which of the following correctly describes the equilibrium effects of a per unit subsidy? a) Consumer price rises, producer price falls, and quantity increases. b) Consumer price falls, producer price falls, and quantity increases. c) Consumer price rises, producer price rises, and quantity increases. d) Consumer price falls, producer price rises, and quantity increases. 12. Refer to the supply and demand diagram below. If an output (excise) tax of $5 per unit is introduced in this market, the price that consumers pay will equal ____ and the price that producers receive net of the tax will equal _____. 13. Consider the supply and demand diagram below. If a $2 per unit subsidy is introduced, what will be the equilibrium quantity? Consider the supply and demand diagram below. 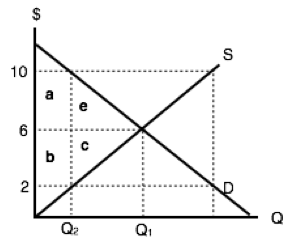 Assume that: (i) there are no externalities; and (ii) in the absence of government regulation the market supply curve is the one labeled S1. 14. If a $5 per unit tax is introduced in this market, which area represents the deadweight loss? 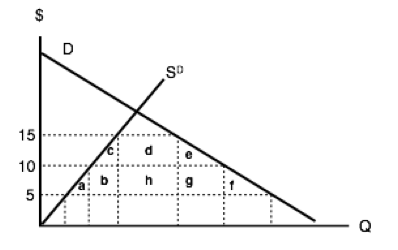 d) a + b + c.
Use the diagram below, illustrates the domestic supply curve (SD) and demand curve for a good, to answer the following THREE questions. Assume that the world price is equal to $20 per unit, and initially there are no trade restrictions in place. a) Consumers will pay a price of $20, quantity sold will be 60 units, of which 40 are imported. b) Consumers will pay a price of $30, quantity sold will be 40 units, of which 30 are produced domestically. c) Consumers will pay a price of $20, quantity sold will be 60 units, of which none are produced domestically. d) Consumers will pay a price of $30, quantity sold will be 40 units, of which none are imported. 2. If a tariff of $10 per unit is introduced in the market, then the government will raise ____ in tariff revenue. 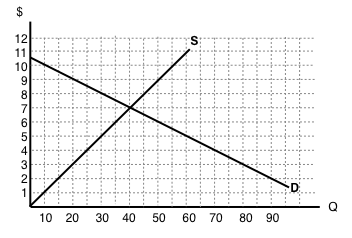 The following two questions refer to the diagram below, which illustrates the domestic supply curve (SD) and demand curve for a good. Assume that the world price is equal to $5 per unit, and that initially there are no trade restrictions. 4. If a tariff of $10 per unit of imports is introduced, which area represents the deadweight loss? c) a + b + c + e + f + g.
d) a + b + d + h + g + f.
5. If a tariff of $10 per unit of imports is introduced, which area represents the tariff revenue raised? 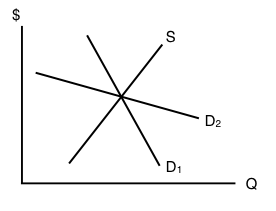 d) b + h + g.
Use the diagram below – which illustrates the domestic supply and demand curves for a good – to answer the following TWO questions. Assume that the world price is equal to $2. 6. If there are no trade restrictions in place, what will be the equilibrium quantity of IMPORTS? a) Imports will decrease and social surplus will increase. c) Imports will decrease and domestic producer surplus will increase. d) All of the above will occur. 8. 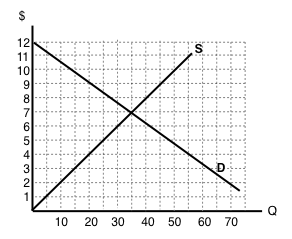 The diagram below illustrates the domestic supply curve (SD) and demand curve for a good. Assume that the world price is equal to $5 per unit. If imports of this good are banned altogether, which area represents the deadweight loss? d) a + b + c + d + e.
9. The diagram below illustrates the domestic supply curve (SD) and demand curve for a good. Assume that the world price is equal to $10 per unit, and initially there are no trade restrictions. If a tariff of $10 per unit is introduced, by how much to imports decrease? Topic 4 Multiple Choice Questions by University of Victoria is licensed under a Creative Commons Attribution 4.0 International License, except where otherwise noted.